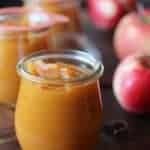 Apple Pumpkin Butter | This sugar-free apple pumpkin butter is a modern twist on a family favorite. The Instant Pot makes this a quick, healthy and wholesome toast topper! Add all ingredients to Instant Pot. Close lid and vent. Turn on Instant Pot. Press Manual. Use High Pressure and cook for 10 minutes. Allow natural release for 10 minutes. Then open vent to release pressure. Once the cooking time ends, the Instant Pot counts up. Use it as your 10-minute timer. Mixture should be thick and chunky. If you prefer smoother apple butter, use an immersion blender or transfer to blender or food processor to blend until smooth. Store covered in refrigerator for a month. This recipe is sugar free because I wanted the apple flavor to shine. If the apples you use are tart, up to ½-cup honey, maple syrup or brown or white sugar may be added. If you don’t have an Instant Pot, you can cook this in a slow cooker, over low heat 4-6 hours. Stir occasionally to prevent sticking.